Imagine chilly fall nights, entertaining guests while they socialize by a roaring fire. Or picture yourself relaxing on a summer weekend with a glass of wine, surrounded by hanging plants and the scent of burning pine. Both are possible with the "Torez" Fireplace Project, which offers an impressive stone fireplace with an integrated wood pergola! Hang baskets from the pergola or plant a few trumpet vines and watch as over summer their dazzling flowers slowly snake their way up the attached trellis! Do you like the design of this Fireplace and Pergola but are afraid the materials will fail to match your house? This Outdoor Room offers a wide assortment of colors and stone types, from Shale to Limestone and everything in between! So let your imagination run wild with the "Torez" Outdoor Fireplace Project by Leisure Select! Contact Family Leisure today! When it comes to quality and value in wood burning outdoor fireplaces and outdoor living areas, nobody beats Family Leisure. 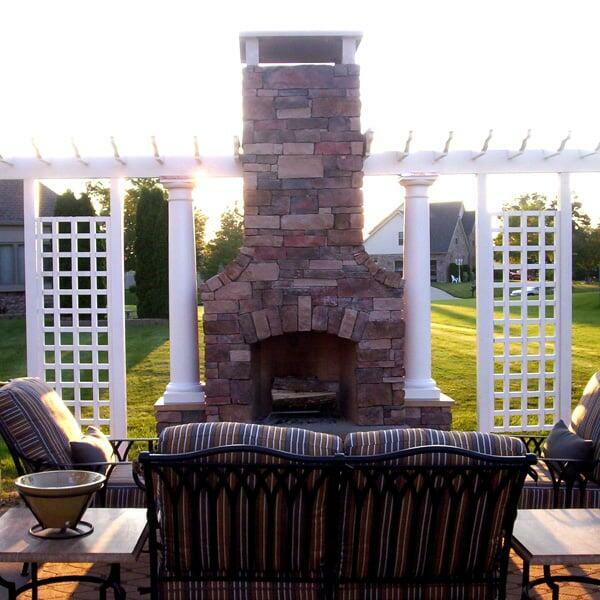 Bring us your ideas and we can custom make the perfect fireplace for your backyard or patio.